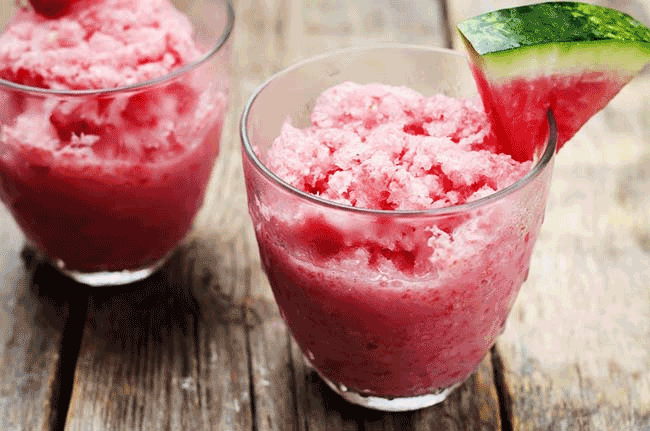 Watermelon Granita - A desert that is good for you and tastes great! Here is a sweet desert that is actually good for you. The recipe makes 4 servings and each serving has only 70 calories, 0 g total fat, 0 g saturated fat, 19 g carbohydrate, 0 g dietary fiber, 1 g protein, 0 mg sodium. In blender or food processor, puree melon to make 3 cups liquid. Place in 9″x 9″ metal pan. Blend in syrup. Cover with plastic wrap and place in freezer. Freeze until slightly hard, 6-8 hours; stir. Before serving, scrape well with fork and scoop into serving bowls.